This is Julie with the CSFF Blog tour! 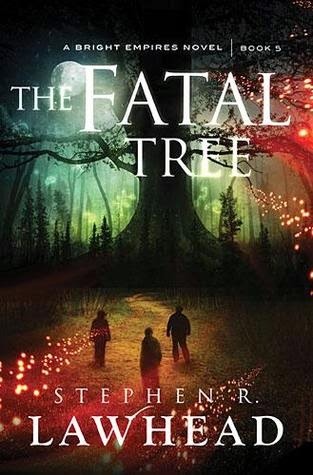 This month's book is The Fatal Tree by Stephen R. Lawhead (Facebook), the final book in the epic Bright Empires Series. In the concluding book of the Bright Empires series, our world--and all worlds--are spinning into chaos, with strange, unexplainable events and anomalies as the universe undoes itself. Kit, Mina, Cass and the other ley-travelers must travel through different times and universes to try to fix all timelines. Can they prevent the collapse of time and space? There is a bit of cursing that surprised me--I can't say it was unwarranted, but it surprised me. Characters - 7 out of 10. Like many series, mostly the same characters inhabit this final book, without many additions. A fairly large number of scientists came along; they blurred together for me. One character has a very drastic change, which I thought worked well. Most of the others were more or less steady. Lady Haven and Mina, the most strong-willed female characters here, had quite a few similarities, but since I like that kind of woman, it didn't bother me. Characterization wasn't really the focus here, but I had no real problems. 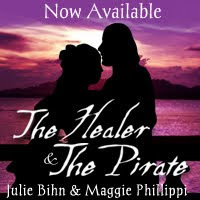 If you read the earlier books and liked the characters there, you'll probably like them here. Suspense/stakes - 3 out of 5. I'll talk more about this Wednesday and this ties into plausibility, but to me, I thought the stakes were too high, if that's a thing. I just could not believe that the entire world--all worlds--would not only be destroyed, but would be completely undone, so that they never existed. Theology aside, the stakes are so high that you know full well that the worst really can't actually happen. To balance this, Lawhead occasionally put beloved characters into peril, which was more exciting, because there's certainly no guarantee that any lead character will survive these newly unstable worlds. And speaking of instability, Lawhead did a very good job of showing the effects of our world falling apart...the thought of a bridge simply vanishing while people are driving across it scares me more than the thought of all of God's creation being undone, because it just feels more plausible. World building - 5 out of 5. The entire series shows a high level of detail and realism. I'm continually impressed by the way Lawhead integrates so many different historical and historically-inspired settings and events. This is one of those series I read and realize there's no way I could write such a thing myself...it just plays to things that I enjoy reading but wouldn't be able to pull together. Writing/editing - 4 out of 5. Overall, I had no major problems with the writing. I thought that perhaps too much time was spent on one character's change, with two separate lengthy internal monologues that I thought overlapped quite a bit of content. One other nitpick would be when two completely unrelated characters from completely different backgrounds and eras start quoting from what sounds to me to be the same Bible translation. In my Bible Study, no one reads from the same translation, so I don't know why these characters would both be using the same translation, unless it's restrictions from the publishing house needing just one translation. Some of the descriptions felt over-long to me. That's more my preference than a problem, but given that literally the whole world is hanging in the balance, I felt like the descriptions, which were fine and even eloquent in previous books, slowed things down a bit too much. Clarity - 4 out of 5. I felt like things got perhaps a bit muddled by the end, but that does make sense, given the plotline. (And in fairness to Lawhead, I may not have read as closely as I should have everywhere, since I was so eager to find out what happened. Plausibility/believability - 3 out of 5. Not everything in this book went along with how I picture the universe and God working, and, fair or not, the idea of God's works being undone didn't really work for me. (Though the scientists here also say that most people don't believe in global warming despite scientific evidence, so I guess that's the same reasoning here?) Etzel also remains superhumanly good, but that's not impossible. Maybe implausible, but I've heard of forgiveness similar to his in real life (and he's technically not in our world anyway). Positive - 5 out of 5. Overall a happy ending and Etzel's actions continue to amaze. Gut reaction - 4 out of 5. Probably my only real disappointment was that I saw the series as being set up as a quest for the Skin Map, more than the Spirit Well itself, but in this last book, the Skin Map is of no significance. There's absolutely nothing wrong with this structure, but I think subconsciously it feels just a touch off because of that. Certainly, this was an enjoyable and satisfying end to the series nonetheless. Free points: 5 out of 5. Recommended for: Anyone who read Books 1 and 2 in the series. Please visit my fellow adventurers on this month's tour! 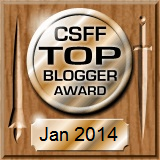 *In conjunction with the CSFF Blog Tour, I received a free copy of this book. Also free tattoos. The temporary kind. Interesting point about the stakes. I think yes--there probably IS such a thing as stakes that are just too high, because we don't believe in them. To me the story was never so much about saving the world as it was about discovering it--discovering truth. The whole thing unfolded as a journey and I enjoyed it on that score. About the Bible translations, though: it was the KJV they quoted, right? Up until maybe about sixty years ago, pretty much the whole English-speaking world would have used that translation alone. So having multiple characters quote from it is actually very realistic for these characters in their historical settings. The characters were Dr. Thomas Young (and you're right; I assume KJV was correct for him) but then also modern-day Cass. OK, what is very interesting is that "'So the Lord God took the man that He had made and put him in His Garden of Delight, to cultivate and tend it" which Dr. Young quoted is ONLY located in The Fatal Tree; it's not actually any known Bible translation I can find online. Did the genius Dr. Young create his own? The rest of his quote is more or less from the more modern KJV (not 1611), with different punctuation. "So the Lord God took the man that He had made and put him in His Garden of Delight, to cultivate and tend it" is from an English Translation of the Knox Bible (which is not online to my knowledge) and is a translation of the Latin Vulgate via the Hebrew and Greek Originals. Now that isn't to say this where Dr. Young saw this particular wording of course. And before you ask, nope not Catholic, just have a couple of Catholic Bibles along with a wide assortment of other versions. I have to say I love the poetic flow of the KJV - though thou's and hast's are not commonly used in day-to-day conversation, I will freely admit. Meagan, I'm betting you're right about that being where the translation is from. I wonder if the rest of Dr. Young's passage comes from there, or if he was mixing translations. I agree with you a hundred percent on the world-building. It was masterful. Good point about the Skin Map. I almost forgot about it in this book! Perhaps the very concept of the Skin Map itself was part of the "sin" of misusing the Spirit Well? One man, having all this power and knowledge, and ultimately not choosing wisely. Just a thought. I hadn't thought about it that way, Jainene; you could be right! Either way, the goal reasonably became what the Skin Map showed the way to, not the Skin Map itself. You make an interesting point about the story's theological aspects--I've never thought about that before. On my part, I put it down as a genre/save the world trope, so the suspense and the stakes worked a lot better for me. But I know what you mean about details like that spoiling a story--I still refuse to believe Dracula, since a vampire (should one exist) couldn't possible steal a Christian's soul, so obviously the author was mixed up somewhere! Good review, Julie. I agree with you on the stakes--hadn't worded it that way until I read your review, but that's essentially it. I was simply not worried and therefore not draw into the story by plot tension. The characters carried the day for me. Thanks! I agree...through the whole series, really, the characters and the concepts of ley travel carried the novel. Do you have a question for us? Post in the comments or email kinyn@kinynchronicles.com!